Bilateral piriformis pain affects both legs. Symptomatic patterns include pain in both legs simultaneously or one leg following the other in order of onset. Statistically, unilateral piriformis pain is much more common than bilateral, but statistics do show that patients who demonstrate pain in one side have an increased chance of developing pain in the other side at some point. Bilateral pain syndromes might be more indicative of some diagnoses than others. Similarly, bilateral pain may actually help doctors to narrow in on specific diagnostic scenarios. This article explores the incidence and expression of piriformis pain in both sides of the body. We will provide an overview of bilateral symptomology, as well as some interesting facts inherent to bilateral conditions. 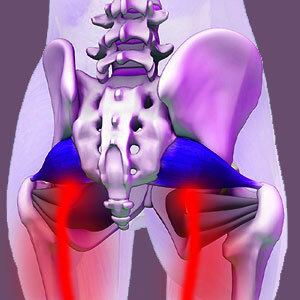 Bilateral piriformis symptoms might begin in both legs simultaneously, although this is statistically very rare. Far more common is the scenario where a patient develops unilateral pain that spreads at some point to the other leg. About 55% of these pain syndromes migrate after resolution of the primary pain site, in essence relocating from one side to the other. About 30% move to affect both legs, since the original site dose not resolve prior to symptomatic migration. Less than 15% of patients demonstrate pain that originates in both sides simultaneously or near simultaneously. Bilateral piriformis symptoms can involve any type of diagnosis, including piriformis syndrome, piriformis injury, RSI or muscular imbalance. People who are affected by soft tissue injury in the piriformis might traumatize both sides together or might cause undue stress and injury to the second side due to weakness in the first side that is already affected. Muscle imbalances can certainly affect both sides of the body, especially when caused by improper training, development or stretching. RSI can affect both sides of the body equally and often accumulates bilaterally. Piriformis syndrome can occur bilaterally due to anatomical abnormality being expressed on both sides, bilateral trauma, functional issues causing bilateral spasms or widespread ischemic pain syndrome that is simultaneously present in both legs. Bilateral symptoms can help to narrow down diagnostic possibilities in some patients, since evidence of the underlying origin of pain will be visible in both sides of the body. This can be helpful in eliminating incidental unilateral theorized contributors that are not present bilaterally. We should mention that we have witnessed a high incidence of oxygen deprivation syndrome relocation from one side to the other, often several times in response to active treatment. While this is illogical from a structural viewpoint, it helps substantiate the psychogenic nature of the pain and can assist diagnosticians in providing patients with better indicated treatment in the form of knowledge therapy to get to the heart of the psychoemotional issues that are causative for pain. Without this breakthrough, most patients are doomed to suffer through repetitively disappointing treatment, followed by failed surgery.